Accelerate your Splunk analysis and get to the cloud. As a healthcare provider, it's essential to perform machine reasoning analysis on-demand with Splunk. Wouldn't it be nice to have a solution that allows you to get to the cloud, scale on-demand and reduce costs? 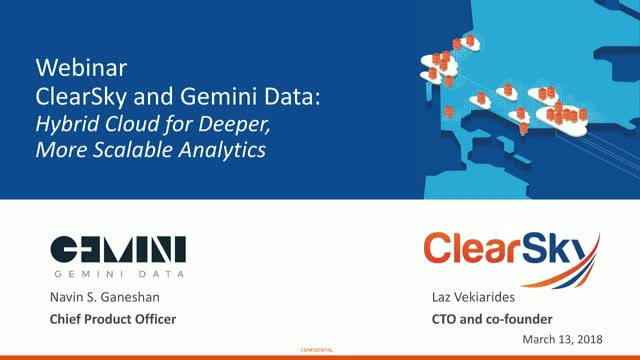 ClearSky Data and Gemini can help. Join us on March 13th from 1-2pm ET to learn how we plan to help you increase your top line revenue and save over 50% on your Splunk investments. Legal Services firms have been living the complexity, opportunity and results of the digital transformation for several years. The move to convert all discovery data to eDiscovery, cloud-forward data sets is both a challenge and an opportunity. ClearSky is helping legal services firms of all sizes get their eDiscovery data into the hybrid cloud and ensuring it's accessible with flash performance, on-demand and fully protected. Join us for this webcast where we'll explore how Miles and Stockbridge, Barrister Digital and others are benefitting from this hybrid approach to storage and data management. When the EU passed its General Data Protection Regulation (GDPR), the May 25, 2018 compliance deadline felt far away. Not so much anymore. To prepare for GDPR going into effect in a bit more than a month, we are exploring 5 best data management practices in this webinar. To prepare for GDPR going into effect, we are exploring what it is, how we can live up to its requirements, and three things your company should do to prepare. How will your organization recover from the next ransomware attack? Join our live webinar to learn how a solid data protection plan can solve your ransomware woes. IoT and machine data growth are raising concerns about security and data access. Join our live webinar to learn how to overcome these challenges when moving IoT data to the cloud. Are you ready to cut your costs, cut complexity, cut ties and get to the cloud? Learn the five things you should ask before you act. You have multiple physical data centers, all presenting hardware, software, networking and management challenges. You’re making several copies of your data, and the petabytes are adding up. You need to tune into this webinar. We’ll share the two fastest ways forward on consolidation. Join Rainer Fuchs and the ClearSky team and explore the risks, opportunities and best practices for the hybrid cloud transformation. Healthcare and biomedical research teams are drowning in data. The ease and speed of data generation creates profound challenges for data life cycle management, with data rapidly moving from active to passive to (rarely) obsolete. In light of growing external threats, effective data protection and disaster recovery strategies have become major pain points for many IT leaders. Both pure on-premises and pure cloud storage strategies have significant downsides, and hybrid cloud approaches – while of great promise – are still evolving and challenge IT organizations’ ability for reliable and cost effective service management and delivery. During this webcast, you'll hear strategies for success in this transformation and will have the opportunity to ask questions throughout the session. In this webinar, we’ll discuss a common problem: eliminating the costs and complexity of business continuity that relies on secondary data centers. If your infrastructure is nearing its renewal or expiration date, you’re feeling the push toward the cloud or your legacy data costs are burdensome, tune in. By reducing IT footprints and eliminating redundancy, ClearSky Data customers realize greater than 50 percent total cost of ownership (TCO) savings. ClearSky Data solves the enterprise storage problem by integrating primary, backup and DR capabilities in one service, dramatically reducing data center footprints, management complexity, and costs. Tune in on December 14th and see how you can eliminate secondary storage, simplify your infrastructure and move to the cloud today. As 2018 approaches, the era of multi-cloud has arrived. With virtually all the tech leaders and innovators offering robust cloud solutions, there have never been more options for organizations looking to move workloads to the cloud. That makes it easier than ever for companies to avoid vendor lock-in and provision the exact services they want, from whomever they want. In this webcast, we’ll discuss how application concerns, cost savings and security will make 2018 the year of multi-cloud and what it will mean for enterprises. Whether you keep your enterprise data in the cloud, on-prem or in a hybrid environment, chances are, you’re making more copies than you’d like to. Of course, you must meet data protection requirements. Unfortunately, what sounds like a two-step process – store the data and back it up – often multiplies into many more steps with many more copies. And every time you duplicate your data, you increase your costs. In this webcast, we’ll look at why this is and what your options are to stop copying data and start accessing it. Join this webcast and hear from ClearSky Data and Google Cloud Platform experts for this one-hour session. They will explore the challenges with hybrid cloud storage today, the performance demands enterprises are facing and five ways you can realize the benefits of high performance storage with built in offsite backup and DR as a service. In the latest IT episode of “Everything Old is New Again,” captive cloud is making a comeback – at least in market conversations. As enterprises navigate the pros and cons of public versus private versus hybrid clouds, “captive” is back in the mix. What does this mean for data centers trying to balance the elasticity of the public cloud with the realities of its actual operational costs for some workloads? In this webcast, we’ll dive into what’s behind the latest rise in captive cloud interest. A year ago, we predicted 2017 would bring difficult, messy hybrid cloud transformation, that “hybrid cloud” would become synonymous with “multi-cloud,” and that IoT and machine data would raise new questions related to security and data access. Our crystal ball was crystal clear last year, and we’re breaking it out again to look forward to 2018. In this webcast, we’ll cover the data storage trends most likely to make news in the New Year, including cloud vendors with on-prem-like strategies, security and the ransomware challenge, consolidation of secondary storage players and the comeback of captive cloud. The victims of ransomware attacks span all sizes of companies across industries. From multinational banks to massive healthcare institutions, no company is safe. How prepared is your organization? During this webinar, we will share our top tips for recovering your business' data and apps with minimum downtime, as well as the critical question every enterprise should ask amid rampant ransomware attacks. While Amazon and other cloud vendors shouldn't predicate their businesses on huge data centers in the middle of nowhere, most IoT applications that require instantaneous response and user interactivity shouldn't be in the cloud, either. With AWS' recent announcement of Greengrass, and Microsoft allowing customers to run its Azure cloud technology directly on their own infrastructure, more organizations are making a move to the edge. So, what does this mean for your business? During this webinar, we'll discuss the future of the edge and how your organization can best leverage it. Healthcare providers have specific and unique requirements around storing and accessing sensitive patient data and meeting HIPAA compliance. But this shouldn’t mean you can’t take advantage of the cost and scalability benefits of the cloud. In this webinar, we’ll discuss four common questions healthcare providers ask when they’re thinking of moving to the cloud and the corresponding strategies to employ a hybrid cloud approach. The cost and complexity of traditional enterprise storage are exacerbated when it comes to data protection. Every piece of data written turns into 15 or more copies for backups, disaster recovery, testing, etc. There are costs for onsite and offsite infrastructure, the corresponding software licenses, all the integration, and management. How do you eliminate all of this? Join us to learn about a fundamentally different approach to enterprise data storage and protection that removes significant cost and complexity from how you manage and access your data. ClearSky Data delivers on-demand, primary storage with offsite backup and DR as a single service. Enterprises pay for their data once and gain access to all their data, anywhere it’s needed – on-premises or in the cloud. IT is now liberated from the treadmill of managing primary, backup and disaster recovery storage infrastructure, and empowered to access all data as if it were local, with on-demand scaling and agility. ClearSky Data delivers data where it’s needed, enterprise-ready and fully optimized to eliminate the cost and data center footprint of traditional storage solutions. Title: Accelerate your Splunk analysis and get to the cloud.